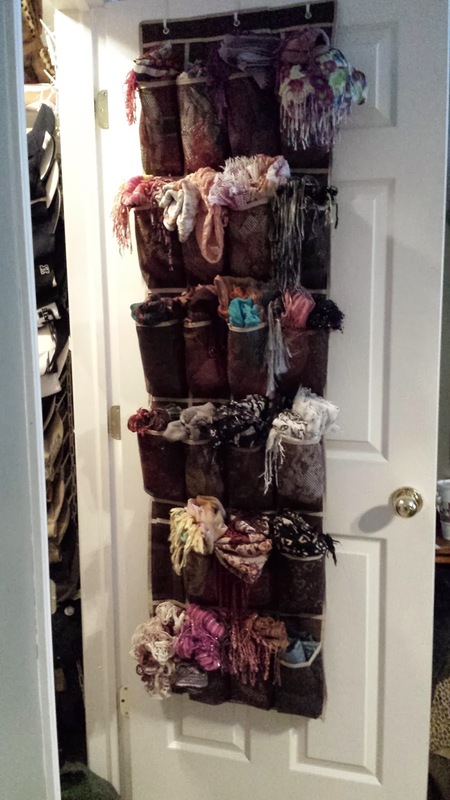 A Girl Named Michael: Organizing My Closet - Part 1 or Is 49 Scarves to Many? Organizing My Closet - Part 1 or Is 49 Scarves to Many? Every year I have a desire to get something in my life organized and some what manageable...this year its my closet. It is a mess on a massive scale. 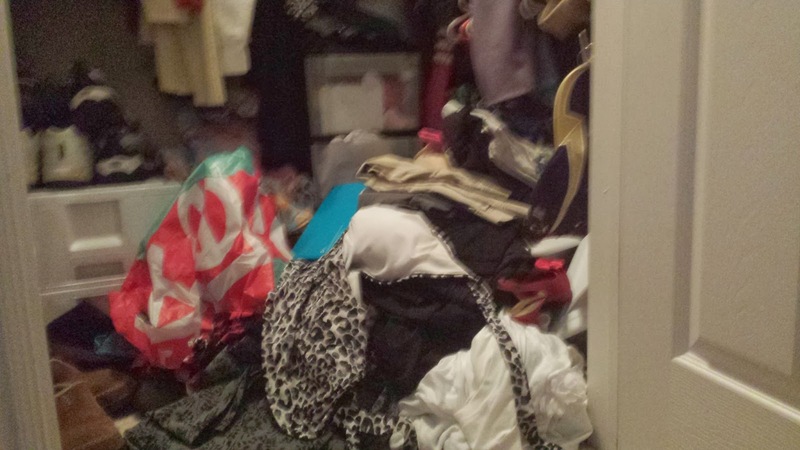 If you judged me just by my closet you would wonder when my episode of Hoarders was airing. I can never find anything, everything is crammed in there and I couldn't figure out how to make it functional. Part of the problem may be the abundance of clothes, shoes and accessories currently in my clothes but isn't that the point of a closet to store your clothes, shoes and accessories. 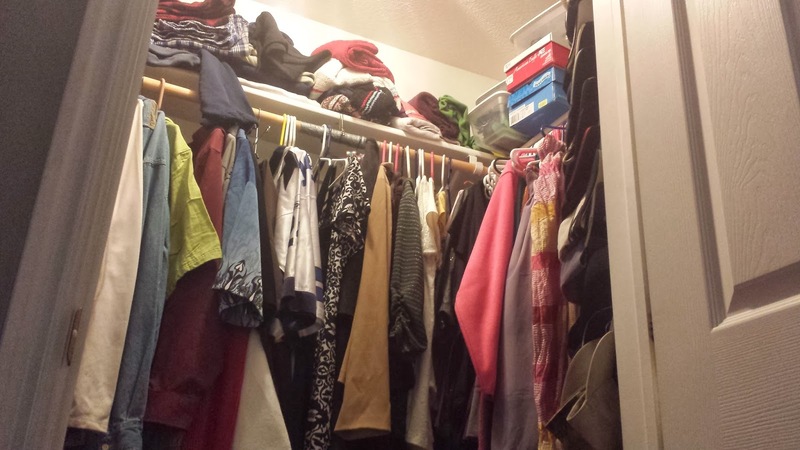 To make matter more difficult I have to share the closet with The Fiancee and its poorly laid out. (I am sure it was designed by some man that thought he will angle it to make it look nicer but really there is just wasted space). After staring at the problem for 3 days I took action. 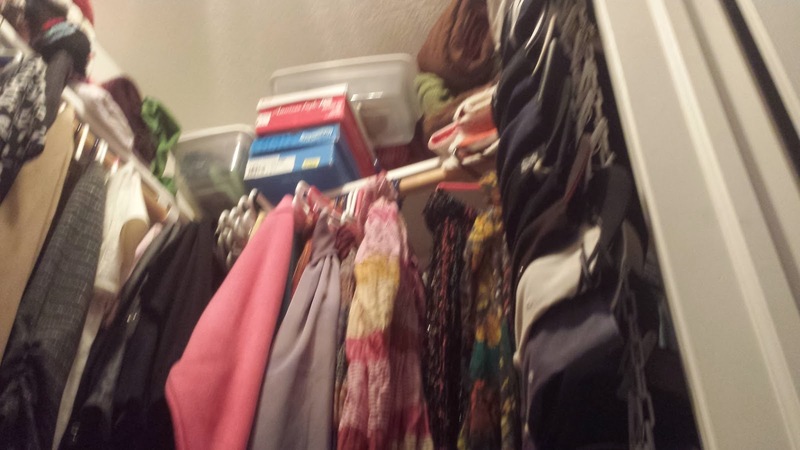 (I would like to note that I am only organizing my side of the closet, The Fiancee can fix his side. I'll help but he needs to do the work, its his stuff). I decide the first thing I need to tackle were all my scarves. I have a lot of scarves. I love them. next to books they may be my biggest weakness. If I see a scarf I buy a scarf. All my friends and family know I like scarves so they buy them for me, often. Even The Fiancee (I wonder how many times I can insert The Fiancee into a single post, I just really like saying it) has bought me a scarf or two (3) since we have been together. First, I rounded up all the scarves I currently owned. Most of them were hanging on hangers in the closet but a few were in a pile on the floor of the closet, some were in a pile on my blanket chest and there were still more in my car. Then I folded them nicely and laid them out on the bed. I then tried to figure out how am I going to organizing all these scarves. It was daunting and overwhelming and just when I was about to throw them all back in the closet I had a moment of brilliance...seriously it was brilliant. I decide in my moment of brilliance to use an over the door shoe rack to store my scarves. See brilliant. I may not be the first person to do this but I don't know anyone else doing it and it worked amazingly. This is just a standard 24 pocket shoe racket. I wasn't sure, at first, it would be big enough because despite getting rid of a few scarves I had 49 of them and I wanted to be able to see them and quickly decide which one to wear. I discovered that the pockets are big enough for 2 standard scarves to fit nicely. I had already folded them so I just paired them with a buddy and start putting the lesser wore ones at the top and bottom. Popular ones at eye level. The bulkier scarves took up one space and all the little ones that you tie on your purse or in your hair are all in one pocket. The Fiancee (5 times) is impressed and I can even add a scarf or two without having to get rid of any. Now I completed step 1 of my closet overhaul...Check back next week for Organizing My Closet - Part 2 or When Did I Buy That?